Audio Editor or Creator/Recorder is one of the most common applications used in audio/sound productions – specifically in mixing/editing digital audio, although you can also use it to create digital content from a traditional audio storage media such as Record or Tapes. Audacity is a cross-platform open source software. Audacity is very easy to use and anyone can start audio editing using Audacity within a couple of minutes. it’s quite popular so in a Linux distribution such as Ubuntu (Latest stable version : 11.10, upcoming version 12.04), Linux Mint etc it’s there in the package repository, by default. 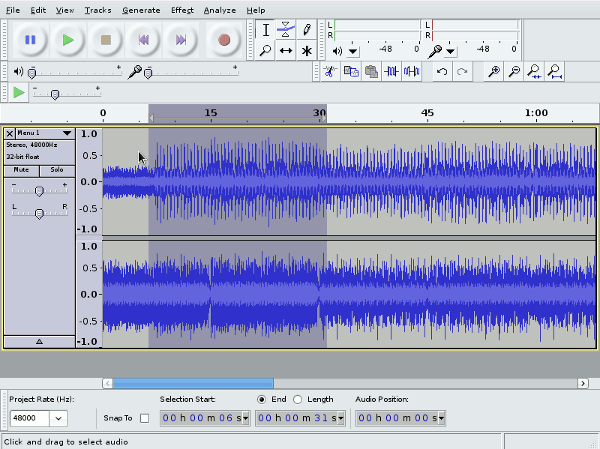 Some special editions such as Ubuntu Studio includes Audacity installed by default, because it’s a great application – as Audacity is lightweight and fast with simple user interface (and of course Advanced Features). What you can do using Audacity ? Plugins are available to add some extra features ‘n’ fun! Non-Ubuntu users can download the required package from the official website. Audio Converter is probably one of the must have application now a days, because it allows you to convert one audio format into another desirable audio format (songs/music for for your mobile or ipod or Android/iPhone or whatever). 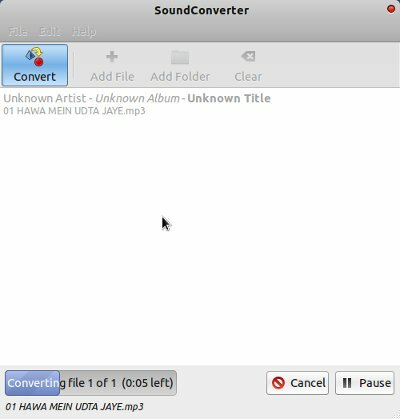 There are lot of free softwares available for audio conversion but SoundConverter is the most popular audio converter application for the Gnome based Linux distributions such as Ubuntu, Linux Mint, Fedora etc. SoundConverter is an easy to use application with all the basic plus cool features you could expect from such application. It supports a lot of formats – in fact it can accept all the input formats that is supported by GStreamer i.e the input format supported by SoundConverter are – MP3, FLAC, WAV, MPEG, ALAC, Ogg, Vorbis, AAC, AVI, DTS, MOD, S3M, XM, APE etc and the most common output formats are MP3 (MPEG-1 Audio Layer 3), AAC (Advanced Audio Coding), FLAC (Free Audio Lossless Codec), WAV etc. When the installation is complete, you can drag the input files to the main window and click on Convert Button. You may want to set the type/quality of output audio files under preferences. Visit official website for information about SoundConverter.